High Quality printing at Low Prices providing you with excellence, reliability and a professional service. 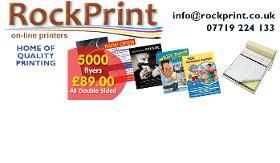 Rockprint are a printing company that provide products that are professionally printed. Use our design services for flyers, leaflets, posters, booklets, business stationary, and much more.